Terri Lyne Carrington launches a new Jazz and Gender Justice program at Berklee. In 1998, Terri Lyne Carrington was the second musician to arrive for one of Herbie Hancock's Gershwin's World recording sessions. Joni Mitchell was already there, and while they waited for saxophonist Wayne Shorter, bassist Ira Coleman, Stevie Wonder, who would add his sweet signature harmonica, and Hancock, Carrington sat at her drum kit listening to Mitchell explore chord configurations on the piano. "She was playing these chords," Carrington said, still awestruck as she sat at her drum kit 20 years later. "But they weren't the song chords. They were these unconventional chords and they sounded amazing." The recollection came during her November 9, 2018 concert at UCLA's Royce Hall, in which she and eight other musicians celebrated the music of living legends Tina Turner, Nancy Wilson and Mitchell. 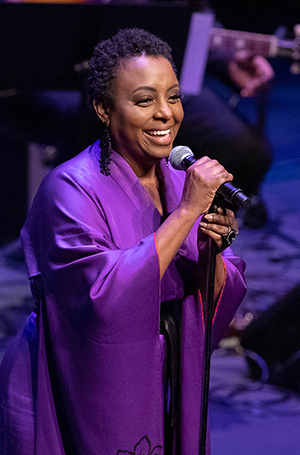 Giving voice to 14 of their songs were Jazzmeia Horn, Ledisi and Lizz Wright and a band of Carrington, saxophonist Edmar Colon, pianist Jon Cowherd, bassist Solomon Dorsey, trumpeter Ingrid Jensen and guitarist Marvin Sewell. A few songs in, she had paused to recall her personal contacts with each one. She had been part of a Billie Holiday tribute hosted by Wilson and she knew of Turner through Shorter, a mutual friend. With Mitchell, however, the shared working relationships ran deepest. Now something ephemeral and personal would link them. "As I listened," she continued, "I was thinking this will never happen again, these chords may never get played again, and I'm the only one hearing them. I wish I had a phonographic memory, or that we had phones back then to record so I could have captured it. But I just sat and listened. It was so beautiful." The tardy men eventually arrived to back Mitchell as she gave Hancock's album her unique take on "Summertime," a jazz standard with an estimated 25,000 versions. Before they came, however, she had given her eavesdropping audience of one an indelible, one-of-a-kind memory. Carrington's UCLA concert, which came near the end of a string of tour dates, was also a one-time-only event. This constellation of artists required some members to travel from the east coast and their schedule demands meant that despite weeks of communicating and planning by phone or Internet, rehearsals would be little more than the afternoon of the show. The kinetics of performing in this way would add energy and focus to the 90-minute program, and it began with the opening number, Horn's lively interpretation of Wilson's "Never Will I Marry" off her 1962 collaboration with Cannonball Adderley. Another Wilson classic, "Teach Me Tonight," introduced Ledisi, whose smoldering rendition was a highlight. Wright's Wilson tribute was "Save Your Love" (also on the album with Adderley), which featured a beautiful solo from Jensen. It was the rarest of concerts: a program of highlights. Even so, there were points that achieved greater heights. One of these tent-pole moments came after Horn introduced her second Wilson tribute in a way that also introduced the singer and the empowering impact she has had on many young women of color. At 13 or 14, Horn said, she saw a beautiful woman, salt-and-pepper hair, on television. Impressed by Wilson's beauty, talent and especially her confident attitude, Horn had said, "I want to be like that!" She then proceeded to lay down a take on "Guess Who I Saw Today," that left no doubt she had accomplished her goal. Wright's first appearance was the evening's second number, Mitchell's "Edith and the King Pin." With a timbre you'd want Mother Nature to have if it could sing, Wright made "Edith" a tent-pole moment that touched the celestial as it tore at heartstrings. She would follow it with another, a transcendent take on Turner's "Better be Good to Me" inspired by her own arrangement of Drake's "River Man" for her 2015 Freedom & Surrender album. Another Mitchell song that raised the stakes began with Dorsey's bass solo. After Carrington and pianist Cowherd gently joined in, Dorsey surprised with a haunting vocal on "Goodbye Pork Pie Hat" off Mitchell's 1979 Mingus, then eased into the first verse of "Both Sides, Now." Wright and Ledisi would slip back onstage for the second and third verses. Horn sang Mitchell's "Love," which Carrington said would be on her next release, and then a time-altering rhythmic intro by Carrington opened another song from Mingus, "Dry Cleaner of Des Moines." Here again, Jensen provided a rich-toned solo that altered below deep dives below the staff and soaring runs far above it. An arrangement of Mitchell's "Ethiopia," which Carrington sang on Structure, her 2004 collaboration with Greg Osby, Jimmy Haslip and Adam Rogers, here provided an extended soloing showcase for saxophonist Colon. In the only reminder of limited rehearsal time, Jensen changed mouthpieces to share the solos, but never got an opening and quietly changed it back. The Tina Turner songs sprinkled through the program either received jazz treatments or were played for their original r&b/rock power. Horn nimbly scaled the heights of "River Deep, Mountain High," Ledisi's moving, meaning-filled "What's Love Got to Do With it?" and the rousing finale with all three coming together for "Proud Mary." The fevered standing audience continued past the curtain calls, so Carrington took the mic to tell us that they had played everything they had prepared. This had truly been a one-time convergence of music and musicians, and as we shuffled or shuttled back to our cars, we knew how Carrington felt 20 years before, listening to Mitchell as they waited for the men to join them. In addressing what is undeniably a "jazz patriarchy," waiting for the men is over, and Carrington has connected with the Berklee College of Music, where she is already the Zildjian Chair in Performance for its Global Jazz Institute. The 1983 graduate, who received an honorary doctorate in 2003, is now the Founder and Artistic Director of the Berklee Institute of Jazz and Gender Justice. Aja Burrell Wood is its Managing Director. "There are a lot of goals," Carrington said in an interview a few days before the UCLA concert. "We'll start in January with a couple of ensembles and a Liberal Arts course called Jazz, Gender and Society and then we'll add more courses in the fall of 2019." Among those goals is raising awareness of women composers and helping move their music into performance and recording circulation. "The standard repertoire in jazz are mostly songs written by men and we want to do research and corrective work to shed some light on truths about women's contributions," she added. "Maybe publishing a collection and creating a library that will have physical as well as digital archives from way back up to the current day." To help progress they hope to collaborate with other institutions, several of which have already reached out for advice on their own programs. "We're not trying to segregate women," she said. "We're open to everyone who is concerned about this issue. Gender equity is up to all of us who care about this society and want to work together to change things." As coursework is added, there will be performance emphasis to create stronger players so that women become less and less the exception in a male-dominated environment. "The other very important thing is promoting women as mentors," she said. "I mentor a lot of young men at Berklee and I think it's important for young men to be mentored by women, as well as for women to mentor young women. "We also need to look at middle school education, in jazz and just in music period, as well as high school," she said. "We'll do outreach to really look at where the problem starts. I believe that it is in middle school where everything starts to be separated with socializing. We need to figure out a way to get more young women in that age bracket interested in playing." Carrington's concert and her curriculum for Berklee raised our sights, letting us experience three exceptional women of music and envision the day when professional women musicians are not the exception. 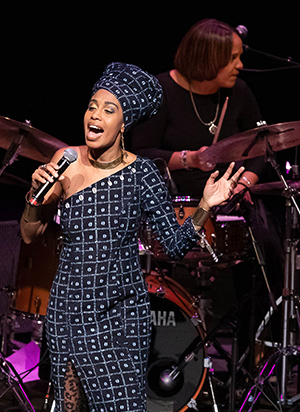 PHOTOS: Lizz Wright (center) performs "Edith and the King Pin" in Terri Lyne Carrington's tribute to the music Joni Mitchell, Tina Turner and Nancy Wilson at UCLA on November 9, 2018. Left to right: pianist Jon Cowherd, bassist Solomon Dorsey, Wright, Carrington, guitarist Marvin Sewell, trumpeter Ingrid Jensen and saxophonist Edmar Colon. First inset: Jazzmeia Horn performs the Nancy Wilson hit, "Never Will I Marry, "; Second inset: Ledisi sings another Wilson classic, "Teach Me Tonight." Photos ©Reed Hutchinson, courtesy CAP UCLA. Mission – Recruit, teach, mentor, and advocate for young musicians seeking a jazz education in an integrated, female-driven environment. It will foster improvisation and creative practice, focusing on jazz pedagogy and TEAM (technology, experience, advocacy, and mentoring) approaches, as well as committed industry and related partnerships. This will create a more equitable, engaging, and enterprising community. Students of all genders and sexual identities are welcome. The first part of the early November interview with Carrington provided this preview of her UCLA and New Jersey Performing Arts Center concerts on November 9 and 11, 2018. Theatertimes 2013 interview with Carrington prior to the ACS concert with Geri Allen and Esperanza Spalding at the Segerstrom Center for the Arts. The preview article that appeared in the Segerstrom Center for the Arts online magazine in advance of the October 2013 appearance by ACS – Geri Allen, Terri Lyne Carrington and Esperanza Spalding.